These Almond Pizzelle Cookies are such a treat! They’re light, buttery and crispy. Add these Italian waffle cookies to your dessert tray or serve them with coffee for a delicious snack! Apparently, I’m only publishing Christmas treats starting with the letter “p” this year. I did Peanut Butter Cookie Variations, last week’s Panettone Recipe, and now, almond pizzelle (peet-ZELL-ay) cookies. 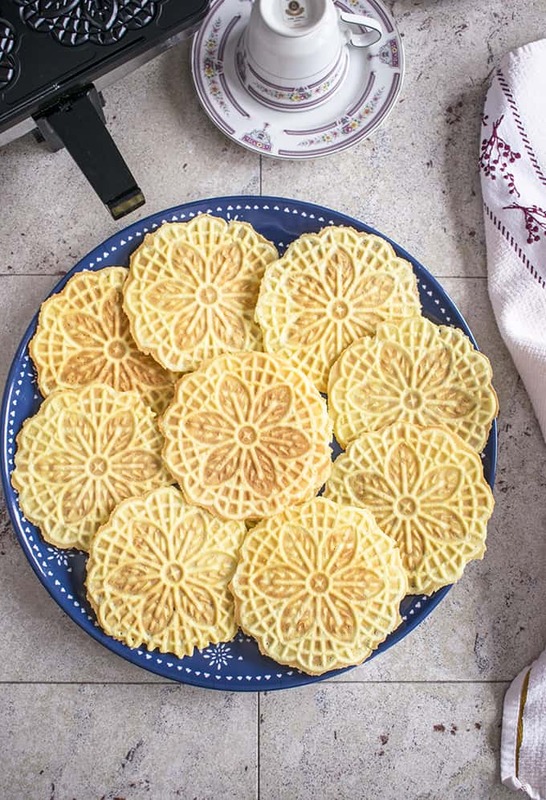 Pizzelle (that’s plural, by the way, so no need to add an “s”), are thin, Italian waffle cookies typically flavored with anise. As I mentioned in my Italian Cookies post three years ago (wow), I’ve never been a fan of anise. So, pizzelle were always “meh” to me. But, I got to thinking. 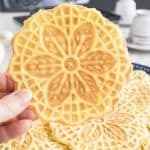 Now that I’m a big girl, with my own food blog and all, I could make any kind of pizzelle I want. So, I asked Mom to borrow her pizzelle maker. * Of course, she gave me a bottle of anise extract too, so I could try a combo of anise and vanilla, the way she makes them. She even had her actual recipe, I mean list of ingredients, written in her binder. I snapped a photo of the list. And, I fully intended to make a small batch of classic, anise pizzelle and one with another flavor, such as lemon. But, later, as I was perusing the manual tucked into the box with the pizzelle press, I came across a recipe for an almond variation. You may recall I have a weakness for baked goods and breakfast items with almond extract. I use it in Our Favorite Pancakes, this Back to School Pound Cake, and even in the dough for this Blueberry Pie with Sugar Cookie Crust. Almond pizzelle needed to happen! So, I began experimenting with using just almond extract to flavor Mom’s recipe. After a couple adjustments (such as adding salt), my pizzelle still needed something. Maybe a touch of vanilla extract, like Mom adds? Yes! That did the trick. And, true story, I’ve never eaten so many pizzelle in my life. I mean, in one afternoon, I consumed more pizzelle than during all my years combined. I wasn’t the only cafone, though. My hubby kept swooping in to steal pizzelle as I admonished him, with crumbs on my mouth, to SAVE SOME FOR THE PHOTOS! So, friends, I’m sharing my almond pizzelle recipe with you. I’m also including the anise option for those who prefer traditional pizzelle. And, by all means, feel free to experiment with other flavors. Lemon? Orange? Chocolate? And, guess what? 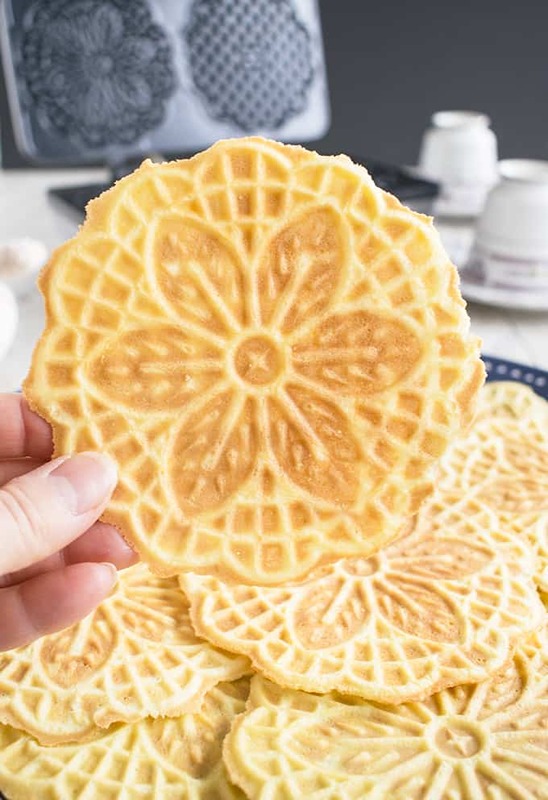 You can even shape the pizzelle into little bowls (mold them around a ramekin while they’re warm) and fill them with ice cream, mousse or custard. If you do, invite me over!! * A note about pizzelle makers. I recommend getting one that has a wide handle that’s easy to open and close. Maybe this one or this one (affiliate links). Mom’s has a thin wire clasp that’s challenging for anyone with joint pain (hello, arthritis) to hook and unhook repeatedly. Also, the thickness of your pizzelle will depend on your pizzelle press. If you want thin wafers, as pictured in this post, go for one with shallow grooves in the snowflake design. If you prefer thicker pizzelle, you’ll need an iron with deeper grooves. These Almond Pizzelle Cookies are such a treat! They're light, buttery and crispy. Heat your pizzelle press according to the manufacturer's instructions. Add your butter to a microwaveable bowl and melt the butter in the microwave, covered. In a medium bowl, beat your eggs and sugar for at least three minutes, until the color is lighter yellow. Add your melted butter, almond extract and vanilla extract to the egg mixture. Beat until blended. Sift your flour, baking powder and salt into a small mixing bowl. (I place a large, fine-mesh strainer over a bowl, add the dry ingredients to the strainer and gently shake the strainer to sift the flour.) Give the flour mixture a stir with a spoon. Fold half of the flour mixture into your egg batter. (Use an under-and-over motion with a rubber spatula.) When that is combined, fold in the remaining flour mixture, just until incorporated. Follow the instructions in your pizzelle press manual for how to cook the pizzelle. Grease your pizzelle iron with cooking spray if required. Cook the pizzelle until lightly golden, or according to your preference. (It will take around 90 seconds, depending on your press.) 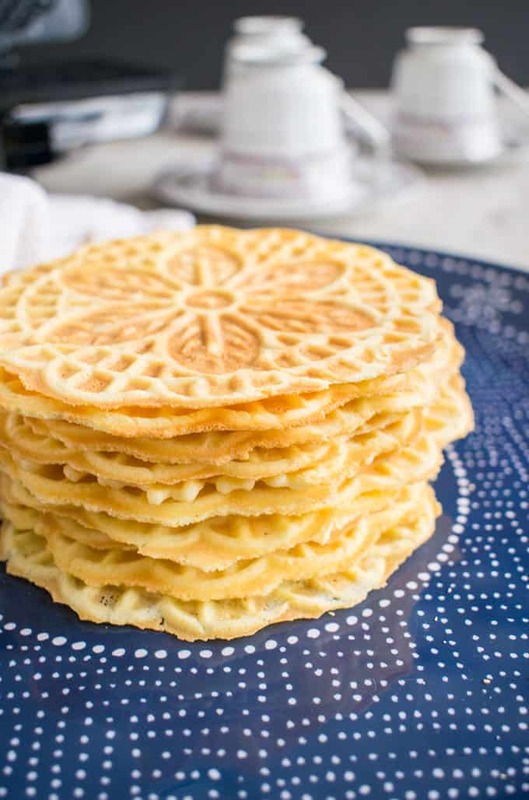 It's likely that the two cooked pizzelle will be connected by excess batter. Leave them that way for now. Store the cooled pizzelle in a sealed plastic container at room temperature. They should keep for several days. For anise pizelle, use one tablespoon anise extract in place of the almond extract. To make pizzelle bowls, you'll need to shape them while still warm, wearing oven mitts or gloves. Use a ramekin or even the bottom of a muffin pan as a mold for the pizzelle bowl. Tried for the first time and they turned out great! My family is Italian and I have always used my mother’s recipe which is quite different, but these are just as good! 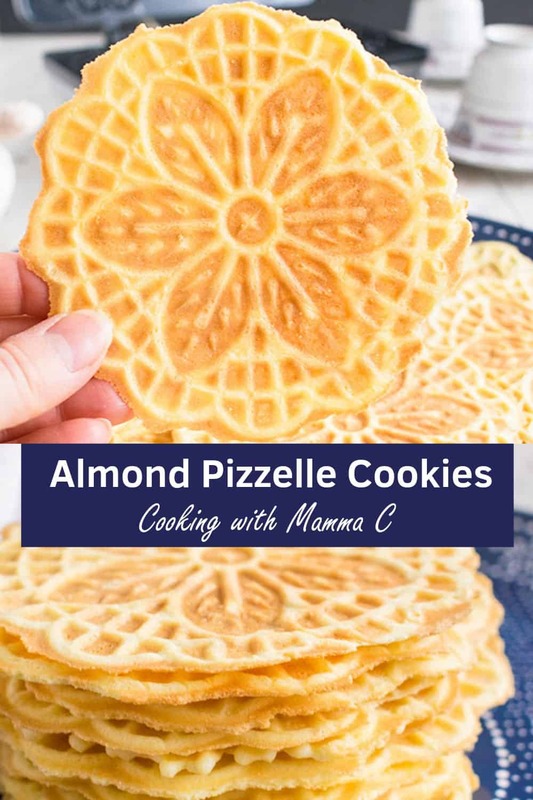 Hi Diana – I’m so glad you loved my pizzelle recipe! Thanks for letting me know. These are so tasty & pretty! It’s like eating art! Hi Jillian – Thank you! The pizzelle pattern makes it easy, since I’m not artistic at all. I just made pizzelle for the first time in my brand new Cuisinart press (ran out of time before Christmas! Or maybe nerve!) I used your almond recipe and they turned out GREAT! DELICIOUS!! Thank you! Hi Nancy – I’m so happy to hear that! Thanks for letting me know. Hi Debra – Have you been using my recipe or another one? The thickness of the batter is a factor, as well as figuring out the amount to use with your pizzelle iron. With this recipe and my iron, I use a measuring tablespoon of batter for each one, and place the batter just behind the center of the pattern. I fill a pastry bag with the dough instead of a spoon. Much quicker! Hi Tina – Thanks for sharing that! I also roll the almond pizzelle up and use as cannoli shells. Use smaller amount of better for mini shells. Yum!! Oh my gosh, that is brilliant! Thanks for sharing, Susan! This is such a sweet post! It really makes me miss my grandma. Also, these pizzelles look delicious. Aww, I bet your grandma made delicious pizzelle. Thanks, Diane! These almond pizzelle cookies are my favorite type of cookie! It goes with everything, coffee, tea, just a perfect treat! Love those! I agree! They’re light, too, so they’re a nice alternative to some of the heavier treats. Thanks for stopping by, Hannah! That reminds me, I need to provide access to Amazon in the UK and other countries when I link to products. I would imagine you could find the pizzelle press there. Thanks, Diana! Thanks, Rebecca! They really are delicious and fun. 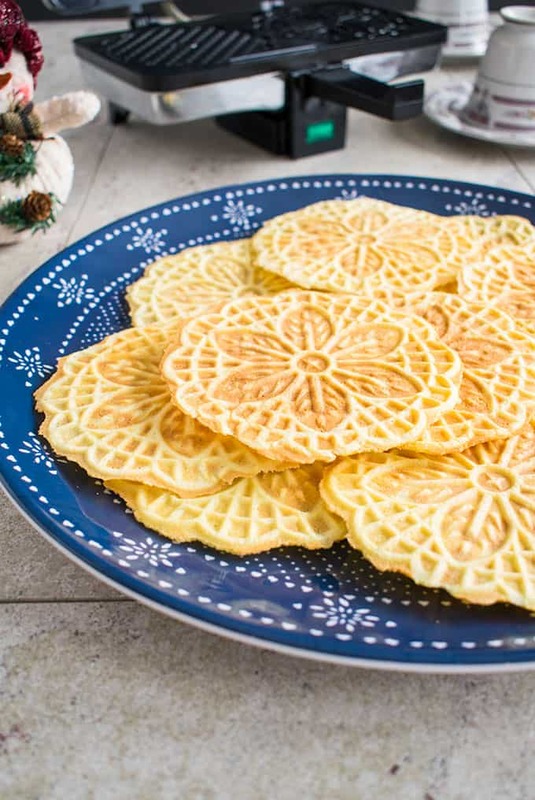 I have always loved pizzelles and never knew how to make them! What a lovely Christmas cookie tradition! They’re so fun to make and eat! Thanks, Monica.